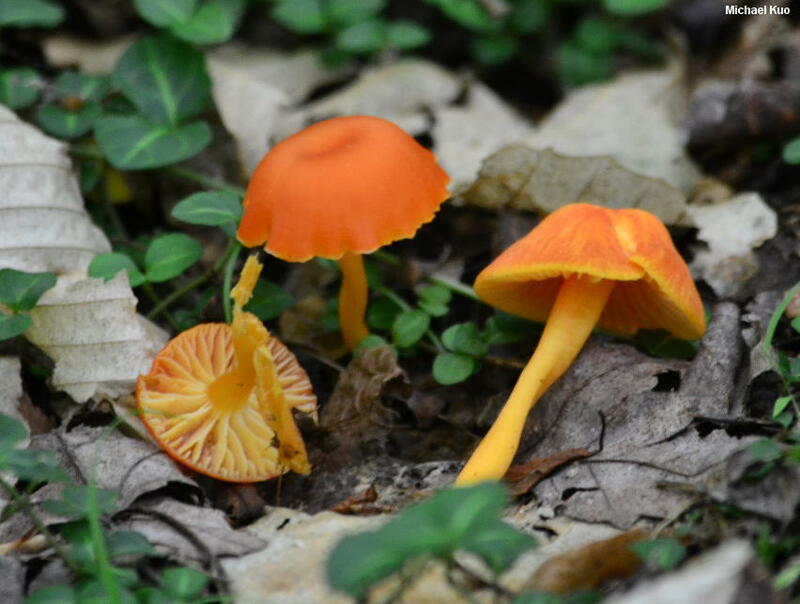 This red to orangish red waxy cap looks a lot like of other confusingly similar species, from Hygrocybe miniata to Hygrocybe squamulosa and even Hygrocybe punicea, but can be separated on the basis of its broadly attached gills, dry cap and stem, and (especially) its distinctively sweet odor, reminiscent of honey that has turned a little foul, best detected when specimens are drying or have been recently dried and packaged for study. 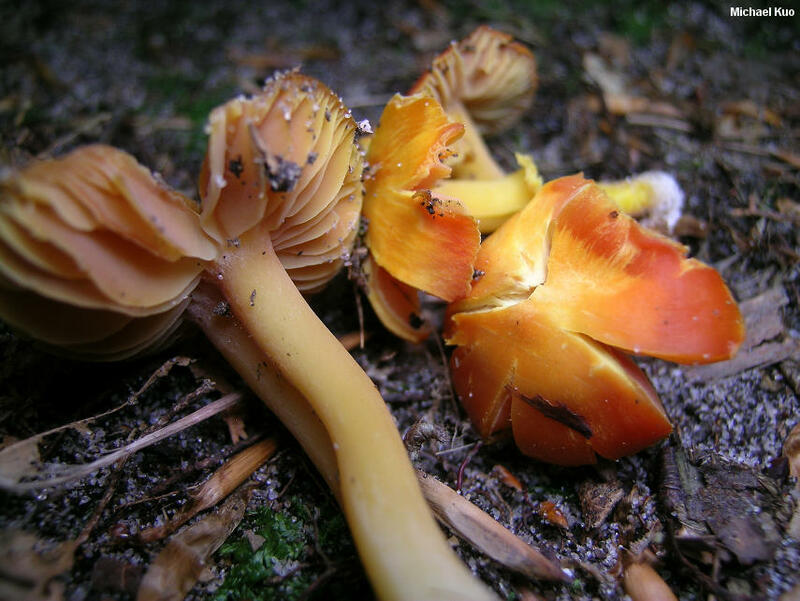 Hygrocybe reidii is a European species, originally described from the French Alps, and our North American version, described and illustrated here, may or may not be the same. Ecology: Precise ecological role uncertain (see Lodge and collaborators, 2013); growing scattered or gregariously under hardwoods or conifers; summer; North American distribution uncertain (it is reported from Québec, North Carolina, and Minnesota in online records). The illustrated and described collections are from Michigan and Pennsylvania. Cap: 2-3.5 cm; convex, becoming broadly convex to planoconvex or broadly bell-shaped; bald or, under a lens, very finely fibrillose; lubricous when fresh but not sticky; bright orange; the margin scalloped when young. 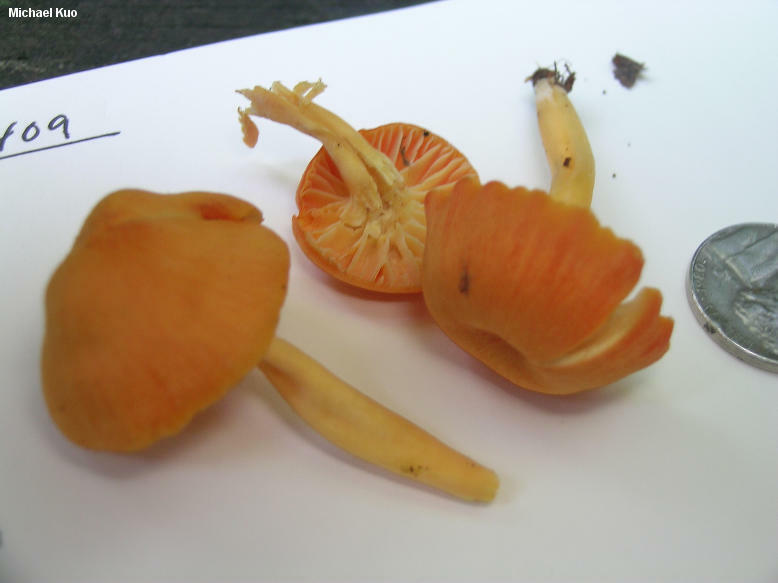 Gills: Broadly attached to the stem; nearly distant; pale orange, fading to yellow; short-gills frequent. Stem: 3-5 cm long; 3-5 mm thick; more or less equal; dry; bald; pale orange, fading to yellowish; white at the base. Odor and Taste: Odor (best detected when specimens are drying or have been recently dried and packaged) strongly sweet and slightly foul, reminiscent of honey going bad; taste not distinctive. Microscopic Features: Spores 6-10 x 4-5 µ; smooth; ellipsoid; smooth; hyaline in KOH; inamyloid. Basidia 2- and 4-spored; to about 55 µ long. Hymenial cystidia absent. Lamellar trama parallel or nearly so. Pileipellis a cutis. REFERENCES: Kühner, 1976. (Boertmann, 2000; Bessette et al., 2012; Lodge et al., 2013.) Herb. Kuo 09110504, 07211409.